The Nine Islands installation examines the under-conceptualized spatial long-span of architectural materiality. 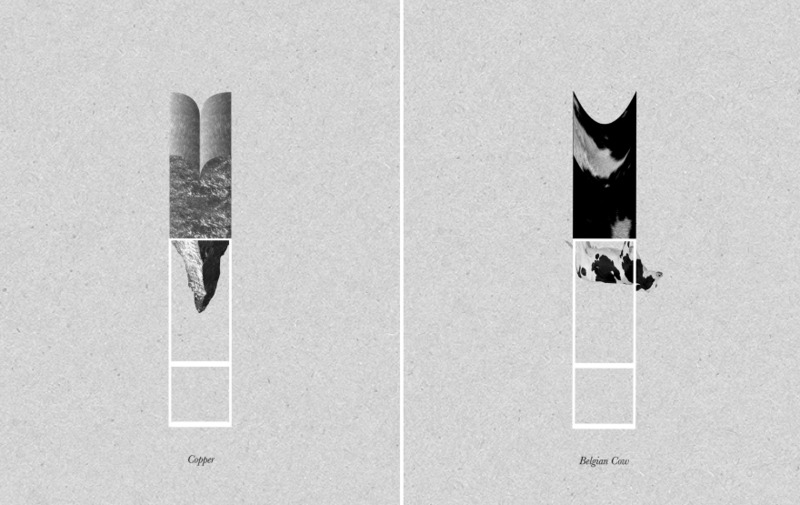 From the recalcitrance and the extraction of a particular raw matter from a specific geographic location, to its processing, transportation, and construction into a desired finished effect in a building and to its demolition, waste, and decomposition, the spatial and temporal span of architectural materiality is very wide (geographic) and deep (geological). 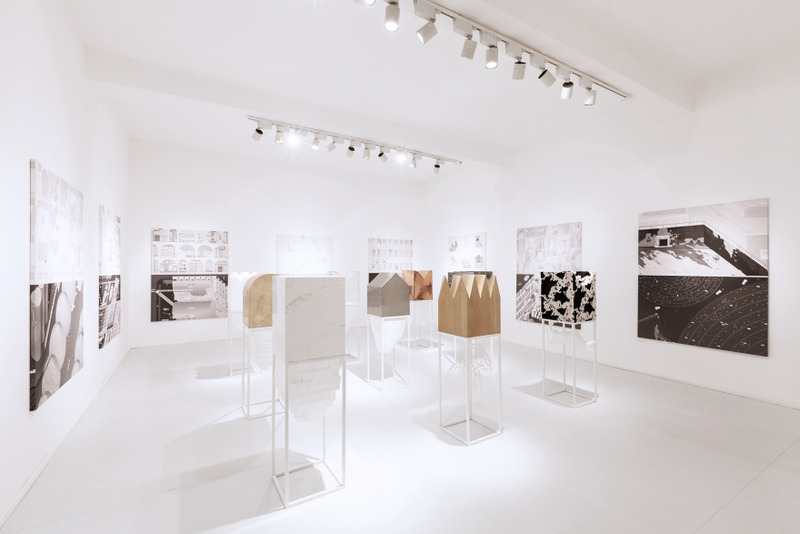 The project showcases this long-span through nine case studies (nine islands) by looking at particularly lavish or widely used nine building materials: certain types of marble, wood, glass, travertine, copper, aluminum, concrete, leather, and plastic. 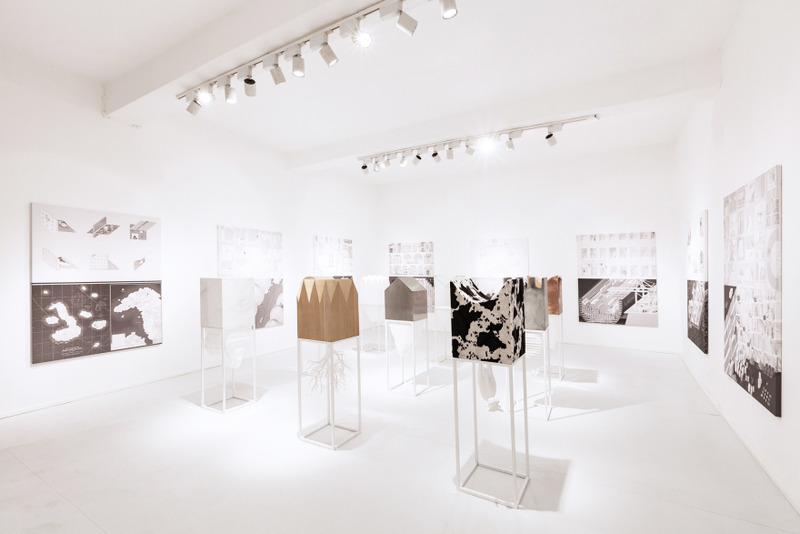 The installation is comprised of nine 180X135cm drawings and nine 40X40X140cm models. The upper part of each model consists of a Monument, an archetypical building mass that is finished with a specific material. As an opposition to the upper part, the lower part of each model consists of a Rock, a formless landmass from which the raw matter is extracted (quarry for the marble, tree for the wood, cows for the leather, etc.). The juxtaposition of the finished surfaces of the typologically abstracted monuments at the top with the vulgar formlessness of the naked landmass below works through two registers. 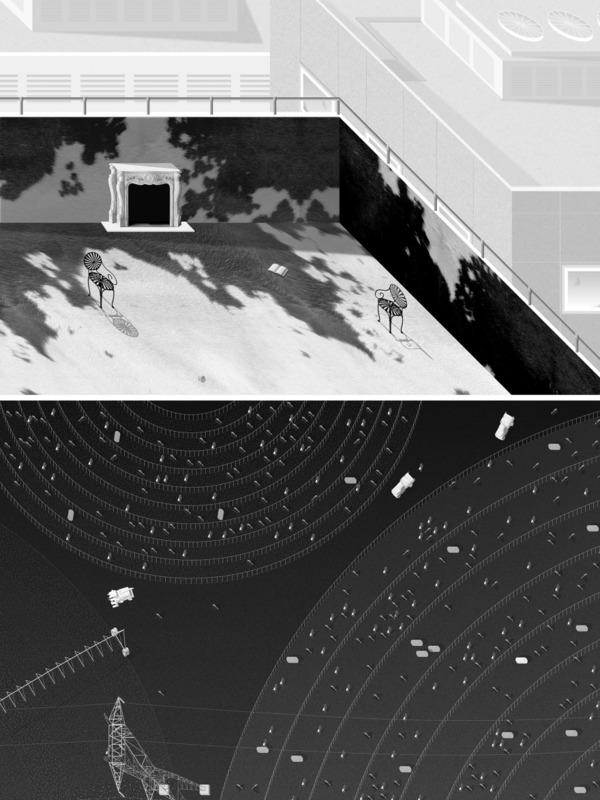 First, the collapse of the finished and the raw aims to call attention to the under-conceptualized space in between. 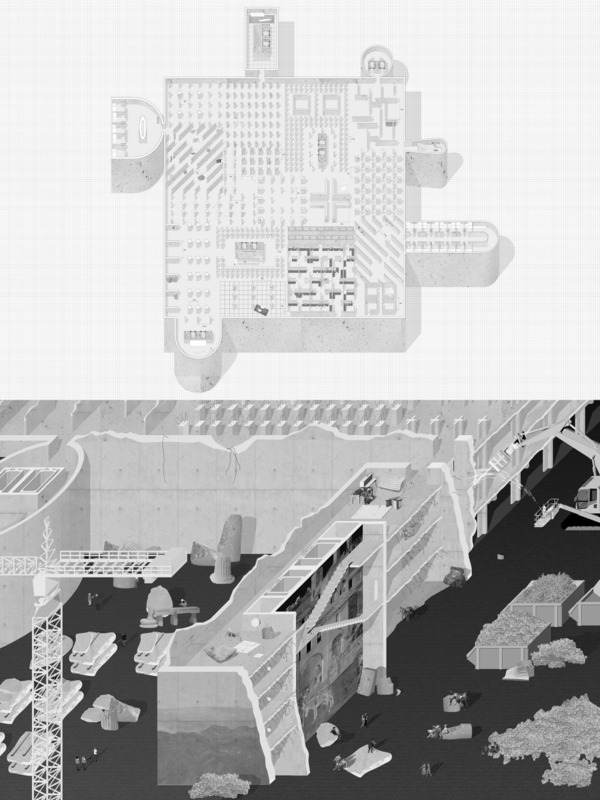 Second, by juxtaposing the slow times of architectural typology and of geology in the space of an architectural model, the project presents each island as a resource ruin. This double signification of the raw and the finished is evidenced in the drawings that are presented as part of the installation. 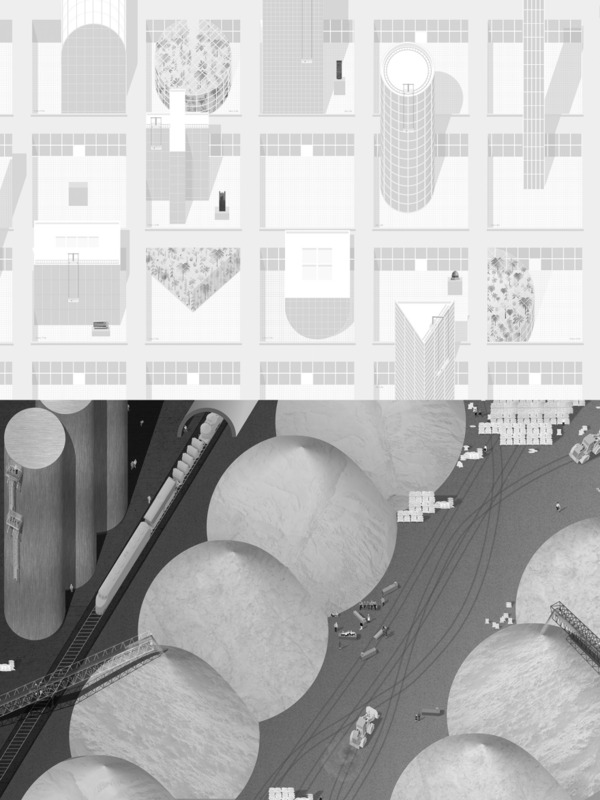 Consisted of two parts, each drawing of the project depicts two different snapshots from the long-span of one of the nine materials. 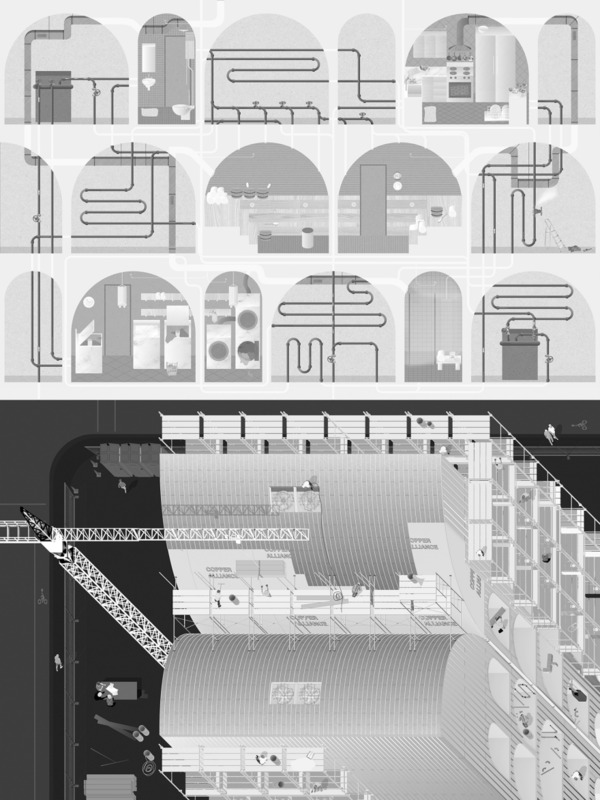 While the upper part of each drawing positions one building material through a particular architectural lens (elevation, section, plan, specification, detail), the lower part depicts a daily life scene from the wider life span of the same material (extraction at the quarry, shipping at the container port, roofing at the construction site, maintenance of the building curtain wall, demolition of the building ruin, management of the waste mount in the ocean etc.). As the upper drawings depict architectural spaces or specifications as still-lifes with traces of everyday life without the presence of humans, the lower drawings showcase over-populated human activity and presence in the extraction, production, transportation, construction, demolition or waste site. Nine Islands positions certain problems brought by climate change and the Anthropocene—such as resource extraction, materiality, obsolescence, and waste— in architectural terms. In the context of climate change where humans are described as geological agents, architecture is both a background and a measure against which the world might be read. Like architecture then, Nine Islands represents the world back to itself. 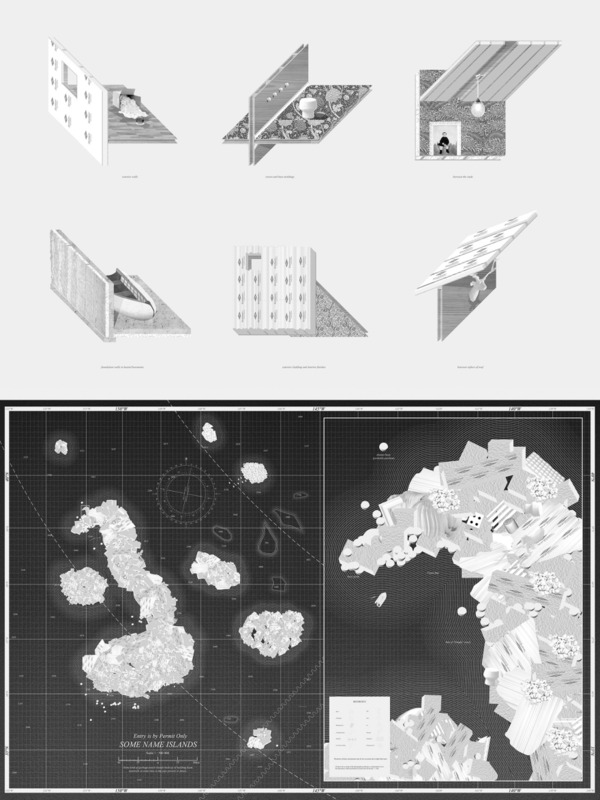 It aims to position climate change as an architectural project. Nine Islands Installation View, 3rd Istanbul Design Biennial, October-November 2016. Photo by Sahir Ugur Eren. GLASS UPPER DRAWING: Our glass curtain walls and all the grids that surround us. LOWER DRAWING: Meanwhile, another normal day at the industrial silica sand. It is almost lunch time. Strata of the world is a jumbled museum. In 1972, Architectural Design published an article on the recently built, 50-story One Shell Plaza in Houston, designed by Skidmore, Owings & Merrill. The editors described in detail the lavish materials incorporated in the building, which came from every part of the planet and included primavera mahogany from Guatemala, Italian travertine quarried near Rome, and Persian walnut from Iran. They criticized the building's use of such rare and expensive materials as irresponsible in light of the "increasing worldwide concern over the use and conservation of the earth's natural resources." One material drew particular scrutiny: real leather, used to sheathe the nine-foot-tall walls of the building's 26 elevator cabs. "The architects," the article reported, "wanted no seams or joints horizontally so had to search the world for nine-foot cows"—the largest raised at the time. How do we understand the materials of architecture in relation to resources today? For some, resources are natural and thus need to be preserved and protected. For others, resources are systemic and thus need to be managed and maintained. In the context of the new geological epoch posited by the Anthropocene, can we conceptualize resource— in this case, materials around architecture— not as merely natural or systemic but geological and geographic? If discussions around materiality in architecture and urbanism usually focus on performance in relation to the material conditions of the building or the city with an instrumental or managerial tone, might a conceptualization of the material as raw matter—both with its (wider) geographic and (deeper) geologic dimensions—bring a new conception of materiality for architecture? While focusing on the long-span of architectural materiality, Nine Islands: Matters Around Architecture installation aims to build unconventional linkages between architecture, geography and geology. 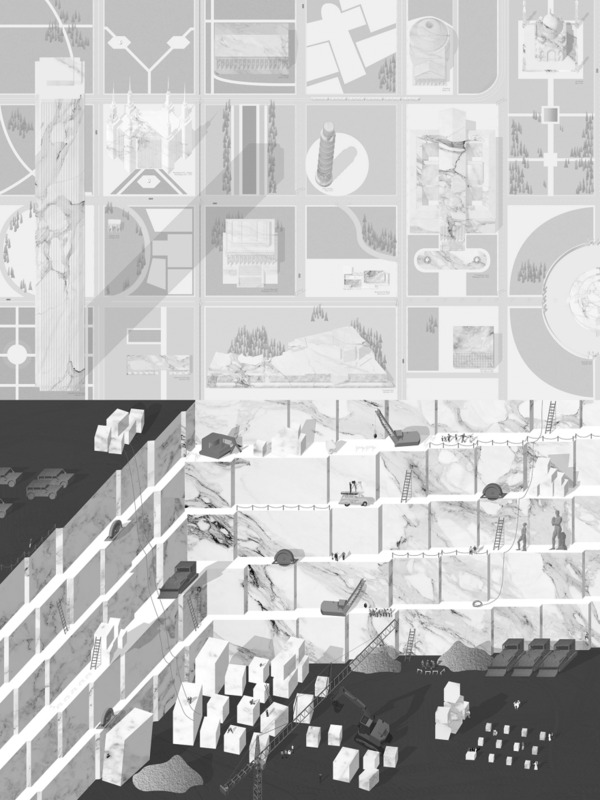 It positions certain problems brought by climate change and the Anthropocene—such as resource extraction, materiality, obsolescence, and waste—in architectural terms. Here, the word "matters" used in the title of this project operates on two registers relative to these questions. First, "matters" depicts an expanded understanding of materialism, which does not reduce architectural materiality to a finished state but to an elongated temporality from extraction of raw matter to waste. Second, "matters" points to the kinds of "ordinary" activities that take place around the material practice of architecture. The wider ambition of the project is to critically examine and demystify two pervasive attempts to conceptualize the environment. First is the attempt to see the environment merely as nature, as something to be preserved and protected. Second is to see the environment merely as a system, that needs to be managed and maintained with techno-fixes. The main argument of the project is that moving away from these attitudes - natural and the systemic - has the potential to trigger alternative planetary imaginaries for design. Inherent in the premise of the project is the proposition of a new conception of architecture's engagement with the wider world through a specific focus on design's capacity to impact planetary imagination by recasting the role of architecture. In the installation, each drawing is printed on a stretched canvas while blurring the distinction among a drawing, a painting, and an image. They each present a particular dialogue between an architectural still-life drawing (upper drawings) and an architectural cappricio drawing (lower drawings). As the upper drawings depict architectural spaces or specifications as still-lifes with traces of everyday life without the presence of humans, the lower drawings showcase over-populated human activity and presence in the extraction, production, transportation, construction, demolition or waste site. Developing in the context of a renewed interest in the ruins of antiquity during the Grand Tour of Europe as well as in the new techniques of representation in Baroque theater stage design, capriccio painting imagined either fictional buildings on a real urban or landscape setting, or presented existent buildings (either as ruins or reassembled wholes) combined and painted in an imaginary landscape. Similar to a cappricio, the lower drawings are neither a true representation of reality nor about creating a utopian fiction, but rather about providing a slightly distorted image based on the very reality of the scene depicted. (LEATHER) A skyscraper roof garden covered with lush leather and false rococo fireplace is a mischievous Corbusian paradox. Background is not Parisian monuments but the roof top chillers. Meanwhile, a coffee cup drops and spills on the skyscraper roof garden covered with leather. Beyond a certain scale, animals at the industrial farms are not visible from Google Earth. (WOOD) Our CLT wood space and our almighty construction specifications. Industrial tree farms are our new gardens. (TRAVERTINE) Lives around our offices with travertine curtain walls; on the outside in dire need to be maintained, in the inside to be accommodated. Travertine to be transported is waiting at the port. Users enjoy the prolonged process. (COPPER) Our saunas, kitchens and restrooms, all heated, air-conditioned and fire-proofed by copper pipes and HVAC systems, waiting to be pampered by maintenance and repair. Can a building with a copper cladding be constantly in construction? There is anxiety that it will be in this state forever. (CONCRETE) Our buildings are the field condition of concrete cores, walls, columns. Nothing more, nothing less. Any concrete building to be demolished is a ruin for the city. (ALUMINUM) Our aluminum profiles and the all the everyday life that leaves a trace around them. Any aluminum smelter is an image of a contrast between a technological interior environment within a wilderness landscape. (MARBLE) What would an open air architectural museum with all the important marble buildings look like? 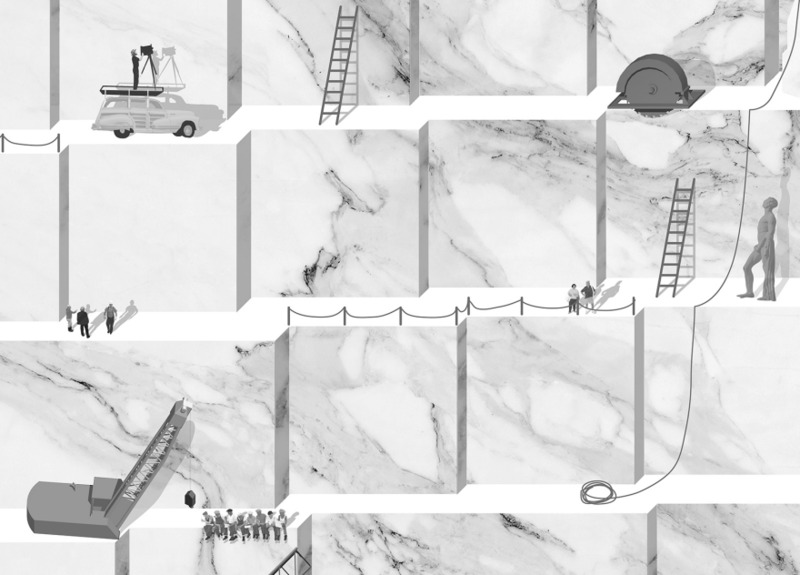 Marble quarry is our new public space. (STYROFOAM) Our insular environments are filled with our Styrofoam. All that Sytrofoam building material is now on a waste mount at the Pacific Ocean Garbage Patch. (GLASS) Our glass curtain walls and all the grids that surround us. Meanwhile, another normal day at the industrial silica sand. It is almost lunch time. Consider two depictions of the Colosseum in Rome that were produced a little more than a century apart. First is the plan drawing of Carlo Fontana's 1725 project for the erection of a church on the arena of the Colosseum amphitheater, which turns the oval organization of the existing plan into a centralized building arranged around circular passages. Second is English botanist Richard Deacon's Flora of the Colosseum from 1855, which records 420 species of plants growing in the ruin state of the Colosseum, some of which were rare species whose seeds were primarily transported to the site by the animals and slaves brought from Asia and Africa for the city's numerous spectacles. When positioned next to one another, these two depictions of the Colosseum put forward an important coupling of two different dimensions of architectural longevity. First, as illustrated by the Fontana plan, is the expanded life-span of a particular building after its original use and its inherent capacity for flexibility despite programmatic obsolescence. Second is the idea of material long-span, which complicates the delicate relationship between natural and man-made systems within an elongated temporality as presented by Deacon's plant inventory. Given our contemporary environmental, political and economic instabilities, a discussion on the architectural long-span might seem to point towards already exhausted undertakings in our field: foregoing the architectural object altogether for the sake of ultimate flexibility and ephemerality, foregrounding the idea of performance for a "realist" mission, or declaring the sole permanence of the architectural object with a relative suspension from questions of temporality. If we have already come to realize the dead-end quality of these discussions and their derivatives, then another question follows: What if our objects, geographies, and geologies cannot be neatly categorized as flexible or ephemeral but instead are in dire need to be reimagined in their expanded temporal and spatial long-span, i.e. in their unfamiliar permanence? As an alternative to relying on prescriptive efficiency measures, one could instead see an emerging body of speculation in the field of eco-criticism that understands environment in its temporal and spatial "long-view"—that is, within a longer span of time and larger span of earth, offering an important, expanded interpretation of our relationship to the earth as humans.In parallel, can we consider a similar intellectual shift in our understanding of architectural materiality within a longer span of time, and a larger span of earth? 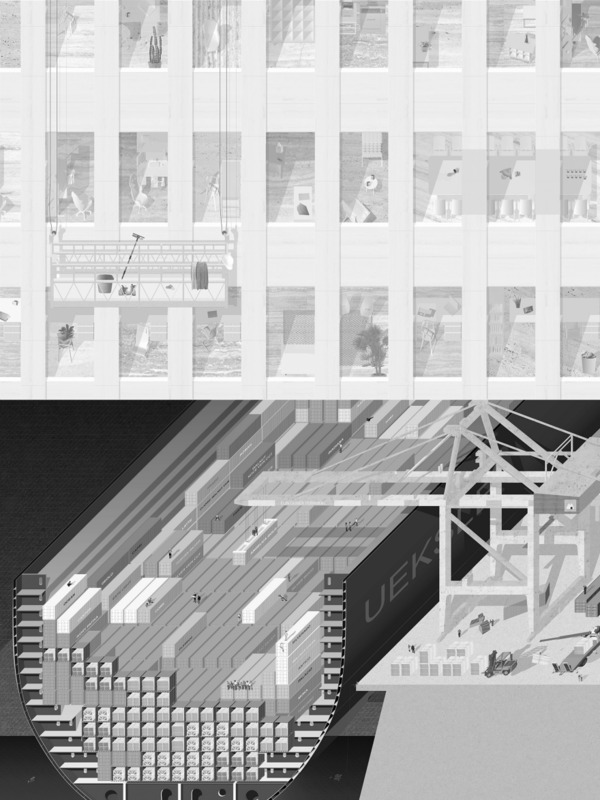 NEMESTUDIO project team: Neyran Turan, Mete Sonmez, Soo Ok Han, Daniel Haidermota, Darcy Spence, Betsy Clifton, Isabella Warren. Production byIstanbul Foundation for Culture and Artsteam, coordinated by Merve Yucel. 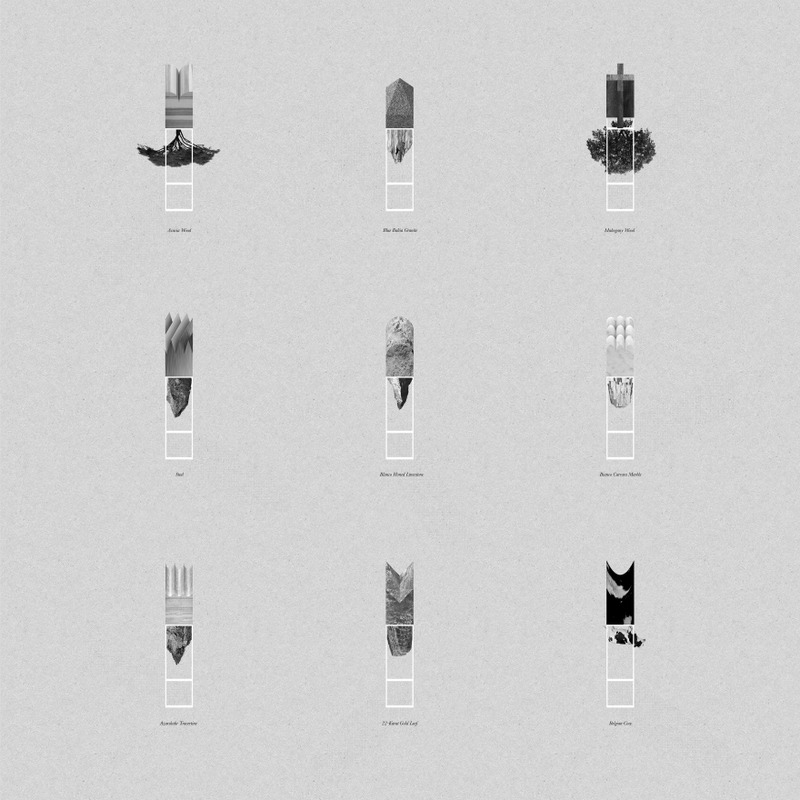 3rd Istanbul Design Biennial "Are We Human" curated by Beatriz Colomina and Mark Wigley, with Evangelos Kotsioris.